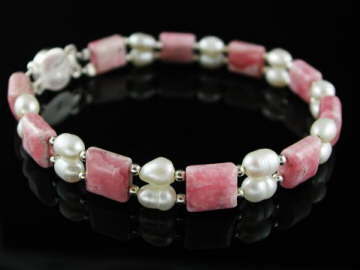 Featuring AAA Grade Rhodochrosite from Argentina, this beautiful bracelet is set with genuine white AAA Grade freshwater pearls and sterling silver beads. Rhodochrosite (whose name means 'rose-coloured') is a superb emotional balancer - said to help heal emotional wounds and traumas and when worn is also believed to attract love into your life. It inspires forgiveness; of the self and others, helping us learn the lesson of compassion. A stone which brings hope to the wearer. It has a round, sterling silver clasp fixing, engraved with the chinese symbol for happiness.